It's here! Sneaky peeks with TCP Stamps! This release is a little smaller than the one's you are used to, but it is still packed with cuteness, humor, and sophistication. For my peeks, I am sharing with you two cards I made. One is with the set called Doodled Shells. I could not resist embossing this and water coloring the insides to make a CAS sophisticated card. Isn't this set just beautiful? As you can see, the top panel of the card is embossed using Ranger's ep in Liquid Platinum. First, I had arranged them in the order I liked using my MISTI. Once I was happy with that, I inked up all the stamps with my Versamark ink and stamped the panel twice to ensure good coverage. Before adding the powder, I used the starfish to accent a few areas for filler. Once heat embossed, I used my watercolor pens to color the inside of the shells. The sentiment was stamped and my Copics used to color in the words. I can see myself using this set a lot this summer! For my second card, I am using the super fun and cute set of Bunnies at Sea. I mean, how could you not love a bunny pirate?! :) It was a hard toss up of using the snorkeling bunny or the pirate ship for this card. But, the sentiment is hilarious that I had to use the snorkeling bunny. In addition to using this set, I am also using the new release Cut Up of Beach Waves. I just love the added stitched marks to the wave. I used this Cut Up to create the water bunny will be snorkeling in using two different colored shades of blue. Once the image was stamped and colored in using Copics, I fussy cut him out to be popped up over the "water." The fish were stamped in different colors and the card was completed by adding the sailboat, which comes with the Beach Wave Cut Up, and the sentiment was stamped directly onto the top panel. I did add a few drops of Glossy Accents to the water and added some to the bubbles. Thank you for stopping in and sure hope you join us next week for the new release blog hop! Are you IN IT TO WIN IT? You could win a $10 gift certificate to the TCP store just for leaving a little love as you hop around! Both pure fun and beautiful projects. I love how you colored the shells. Super cute. Love the layered waves and Buns! 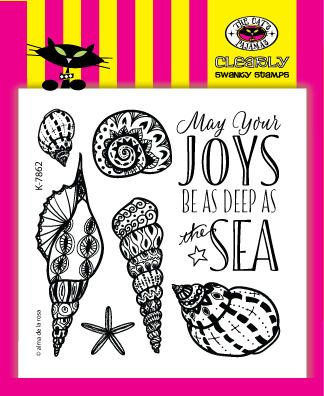 Love the sophistication of the Doodled Shells card and the wonderful whimsey of the Bunny. I also love the way you stacked "the waves"! Great card! LOL...i love them both but your 2nd card has me cracking up! Wonderful cards Deborah! Love how you colored the shells. Great release too! Love the way you colored the shells in your first card, and the big earred bunny is just adorable with his scuba diving gear! Great cards! Lovin' the release!